It’s hard to keep your energy up for these conferences and I am sure I was not pushing it like some that come to this congress. I had no workshop set up for this day so I was able to stroll in more casually. I eavesdropped on the presentation by Keegan Gerhard, somewhat of a local celebrity in Denver, who was doing a presentation on ice cream making. He said that when he worked at Charlie Trotters, Charlie would challenge him to describe sage without using the word sage. Charlie would challenge him to do that with all types of products. I contemplated that for awhile and then I went strolling into the front part of the Armory, where other seminars were taking place. I notice they were setting up for the “Somm Slam” and the person at the door asked me if I was planning on attending. I asked if it was open to me and they said yes. Well definitely then. It turned out to be a very cool event. 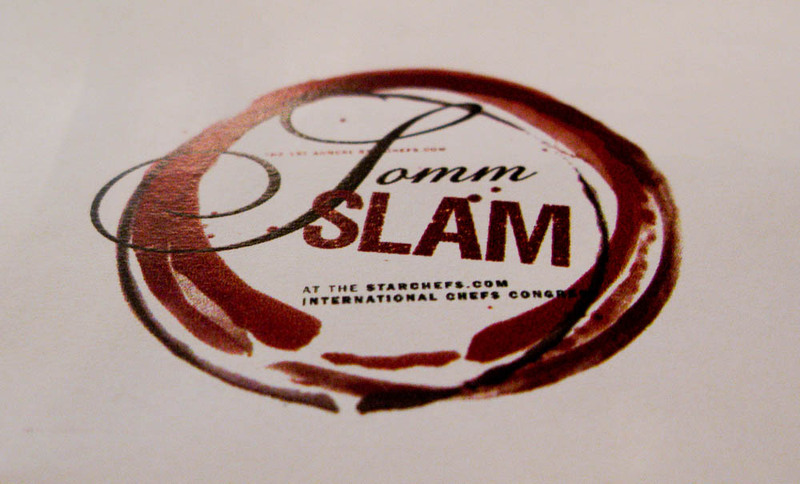 Two sommeliers in the final round of a Slam over the course of 3 days went palate to palate pairing three wines with three different courses prepared by Iacopo Falai an Italian chef from Firenze and the chef owner of Falai in NYC. This is how it works. The chef prepares the course, the two sommeliers get 30 seconds to taste the dish and then they both go to a table with a full selection of different wines and chose what they feel will be the right wine to pair with that specific dish. Meanwhile the chef continues to plate the course and it gets passed around to the audience. The two sommeliers pour their chosen wines for the audience. 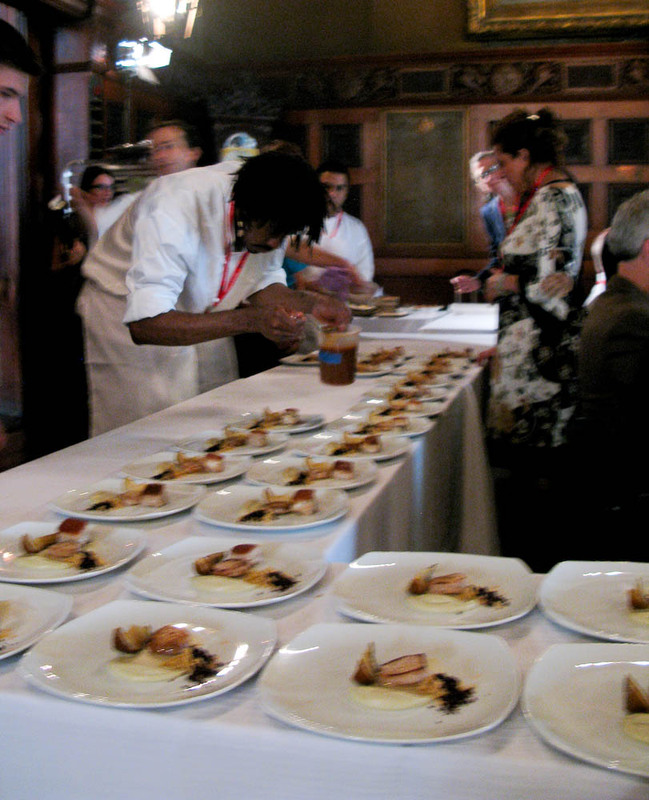 The audience taste the dish and wines and vote for what they feel is the best pairing. The whole time there is another master sommelier who is quizzing them on their choices and asking other sommeliers in the room to present their opinion on the pairings. Very illuminating and interesting to peek into the mind and palate of the nation’s top level sommeliers. The two sommeliers to make it to the finals were: William Sherer from Aureole in Las Vegas and Andrew Myers from CityZen in Washington D.C. The prize a trip to visit the Ruffino winery in Tuscany. The wine selection were all from Constellation Wines who has a rather large group of wineries under its umbrella. I’m familiar with them because their rep comes to my school all the time and we carry a fair amount of their wines. The first course that Falai put together was Foie Gras with Pine Nut Biscuit, Moscato d’Asti caviar, Pickled Butternut Squash, and Horseradish Foam. So when you hear foie gras as a sommelier you have to be thinking a sweet wine. However when you tasted this dish the foie gras was more of a mousse rolled in the pine nut biscuit. The pine nut was the dominant flavor. Anyway both sommeliers paired “out of the bottle” wines. William paired it with a Robert Mondavi Fumet Blanc (Sauvignon Blanc) and Andrew paired his with a Hogue Gewurztraminer. Surprisingly for me the Fumet Blanc worked best. The next course was Agnolottis filled with ricotta served with tomato granita and pea purée. William went for the Ruffino Orvieto and Andrew chose a Kim Crawford New Zealand Sauvignon Blanc. I felt that neither was an ideal pairing but with only the two to choose from I preferred the Orvietto. The Orvietto just didn’t have the level of acidity I felt was needed to counter balance the sheep’s milk ricotta. The Kim Crawford was not the odd pairing I anticipated, but was not the perfect one either. They could have chosen a light red but went white instead. 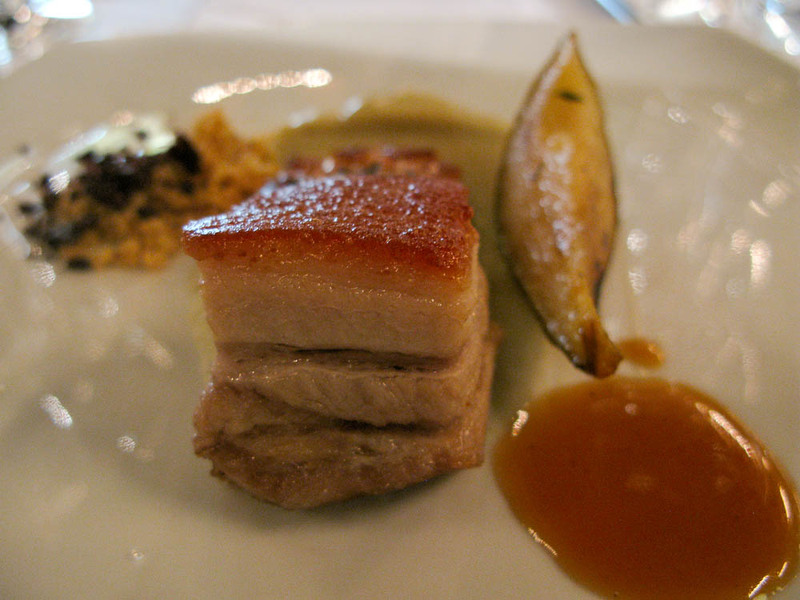 The final course was Milk-Fed Piglet, Pear, Hazelnut, Smoked Lardo, and Jerusalem Artichoke. They both chose reds this time, William chose a Simi Cabernet Sauvignon and Andrew chose the Clos du Bois Tempranillo. For me the Tempranillo was the clear winner. They then rushed us to the main stage to announce the winner of the Slam, which was Andrew. Off to Tuscany as well as sporting a Magnum of Ruffino. The opening presentation of the day was of Suzanne Goin from Luques in Los Angeles. She worked on a pork dish and talked about the challenges of running 3 restaurants and raising her kids. I got out of the restaurant world a little before kids came along and I can’t imagine how I would include both in my life now. One of the two would have to get shortchanged. I missed most of this presentation, as I ran into the sister of a good friend I used to work with in Crested Butte at the Slam. I hadn’t seen her in over ten years. 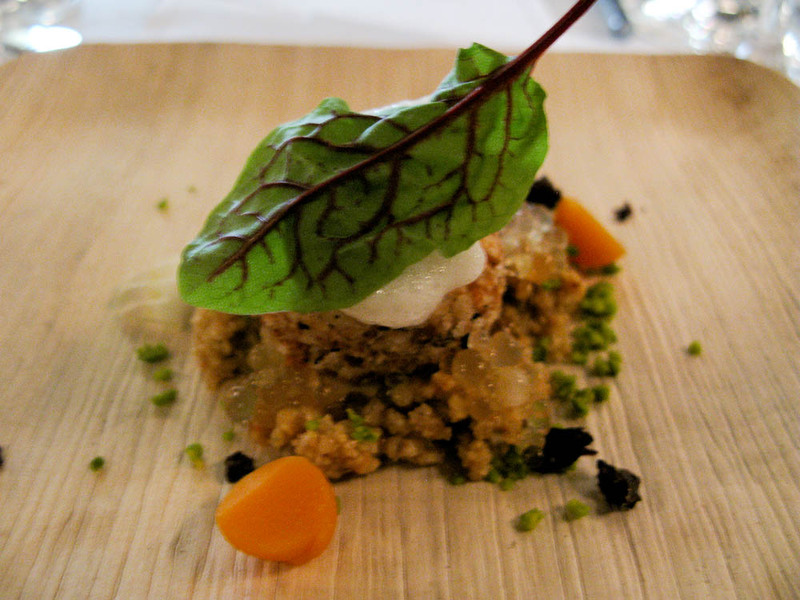 I passed on the following presentation, which was by Kiwi Avant Garde chef Michael Meredith. Then came back to see to see who won the pastry competition which was the pastry chef of Gordon Ramsay’s restaurant in London. The Voltaggio brothers, fairly recent contestants on Top Chef, came out next and did two variations on a “tongue and cheek” presentation. They actually surprised the hell out of me by creating dishes that were both classic and innovative. They are both very talented chefs. Bryan took a more classic approach while Michael took a more innovative direction. They had both just come back from Germany where they were consulting with a company that was designing ready made food texture enhancers (similar to El Bulli Texturas) where you can add them directly to a mixture to get the desired texture that previously would have taken multiple combination of Hydrocolloids. Sort of training wheels for Molecular Gastronomist. They were billed at the last moment because Michel Bras couldn’t make it. 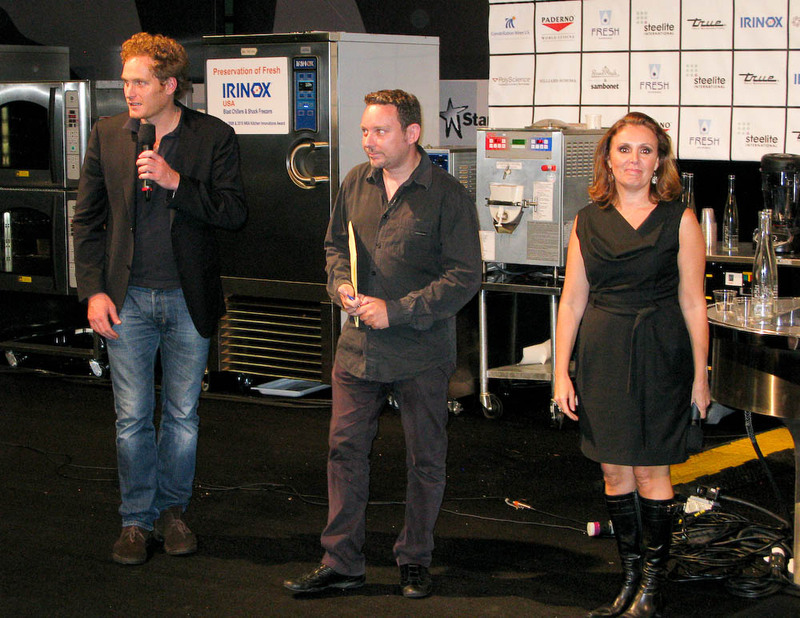 Too bad as that would have been a great presentation before the Albert Adria finale. Michael Voltaggio did a dish that was a deconstructed pastrami sandwich inspired by Katz deli in NYC. The pastrami was a slow cooked Wagyu beef tongue, with sauerkraut noodles (made by juicing sauerkraut and then binding it with methocel and extruding it through a foam canister à la El Bulli), a thousand Island foam and a mustard seed gastrique. His brother Bryan went more traditional with braised beef cheek served with squash purée and mirepoix of baby vegetables. Overall both plates looked very enticing and reflected deep understanding of cooking technique. I passed on the Dale Degroff and Julian Medina presentation on Peruvian flavors in cocktail form and came back in time for the congress finale of Albert Adria. 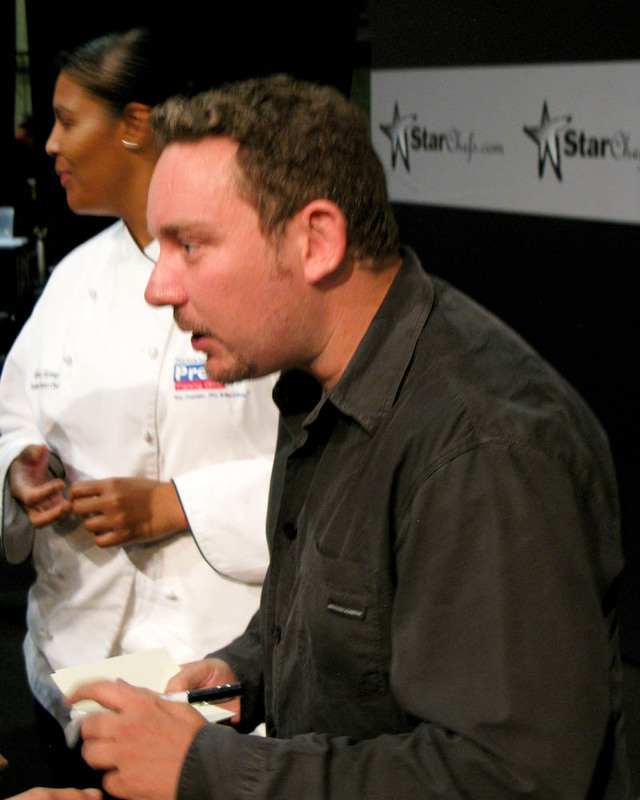 Albert Adria the younger brother of Ferran and co-conspirator in the creation of El Bulli put on a great show. He had us a watch a series of videos, one an excerpt from a day in the life of El Bulli which showed the overwhelming amount of work it takes to put out the meals for the 50 guests each night that came to El Bulli. Then he showed a video about his latest venture in opening Inopia Bar in Barcelona which had a very Tarantino feel to it. Finally he showed a movie about the making of his latest book called Natura (which comes with its own electronic ipod style navigation disk). The book took 2 1/2 years to make and was inspired by, from what I gather from his presentation, his time going to a super exclusive sushi restaurant in Japan. The chef works in complete harmony with nature and it is with this harmony in mind that Albert composed the dishes in the book. Replicating forms in nature in chocolate, in cake and in other pastry textures. 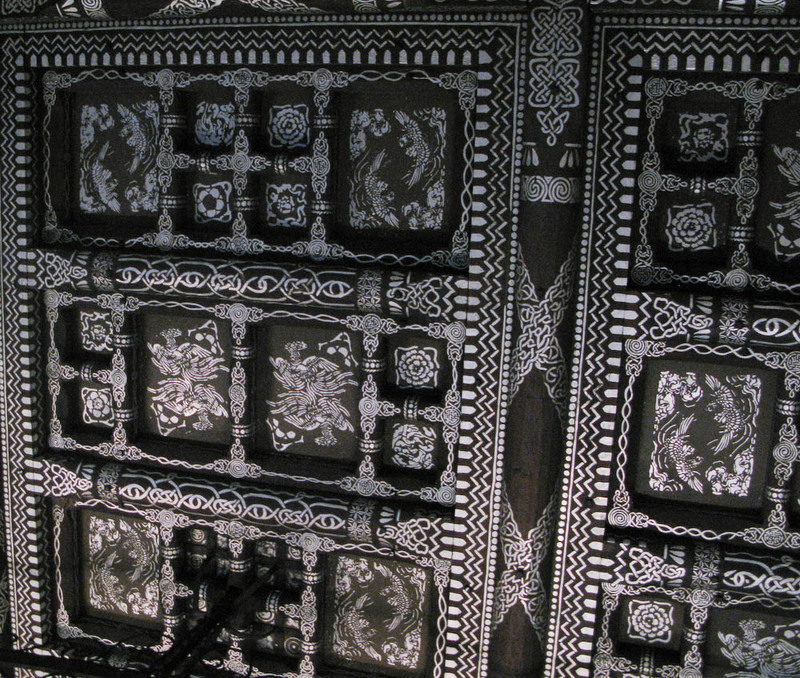 The movie was mind blowing and further showed why a meal at El Bulli was so sought after. Overall the Congress was well worth the trip and it is great to see what the rest of the food world is working on. It is food that is mostly out of my comfort zone, but inspires me to experiment again. Next Year? I like how you put this page together. You did a wonderful job. It’s informative.